Attorney Richard A. Vassallo graduated from Windsor High School in 1981 and attended the University of Connecticut. He graduated in 1985 with a Bachelor of Science in Business Administration and continued his studies at Western New England University School of Law. While pursuing his Law degree he served two years on the Western New England Law Review, first as a Staff Member then as the Managing Editor. He received his Juris Doctor degree in 1989. He was admitted to the Connecticut Bar in 1989, the Bar of the United States District Court, District of Connecticut in 1991, the Bar of United States Tax Court in 1992 and the Bar of the United States Court of Appeals 2nd Circuit in 1995. Richard began his legal career working for the Connecticut Judicial Department in the Hartford Courts. He entered the private practice of law in 1991 as an Associate with the Law Offices of Stephen C. Barron. 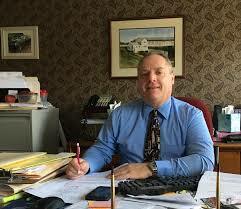 In 1997 he partnered with a colleague to open the Law Offices of Williams and Vassallo in Suffield, CT. In 2005, he left that practice and joined the Firm. Richard’s primary areas of practice are plaintiff’s personal injury, civil litigation, criminal defense, commercial and residential real estate transactions, landlord/tenant matters, family law including dissolution and custody matters, estate planning and probate, and business organization. In addition to his law practice, Attorney Vassallo is active in the community. He is a founding member, and provided his legal services in the organization of and tax exempt recognition of the Windsor Education Foundation (WEF), a 501(c)(3) public charity established to encourage community support for excellence in Windsor public education through funding of innovative projects and programs. Attorney Vassallo served on the board of WEF from its organization in 2007 until 2014, helping to fund over $100,000.00 in grants during that time period. Attorney Vassallo also served as the Chairman for the Paws for a Cause – Public Art Exhibit and Fundraising Auction 2009, supporting Windsor education. He resides in Windsor, and is the parent of two daughters.